It was cloudy but pleasant and I took a photo of the lake from the boat ramp just to give you an idea of what it looks like. We got a nice campsite with water and electricity for $16 a night (since our per person fee was taken care of by our new State Parks Pass). I had some web mastering work to do so we had a quiet afternoon while I created code. This park had free WiFi that actually worked! Our hot spot and our phones worked too. That’s an amazing thing, way out in the sticks like this place was. The forecast was for record HOT weather come Wednesday, so we decided to not spend a second night here and instead head south to the Brownsville area to stock up on groceries before heading to South Padre Island for the holiday. 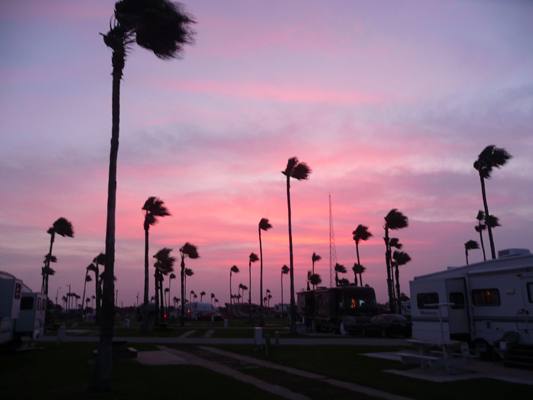 We arrived at West Mission RV Park in the early afternoon and got a spot with water, sewer and electric for just $20 a night with our Passport America Pass. It was in a grassy area next to the road so it wasn’t particularly quiet but we were the only folks in that section so we didn’t have any nearby neighbors. There was a rooster across the highway from us who crowed day and night which gave everything a nice rural feel. 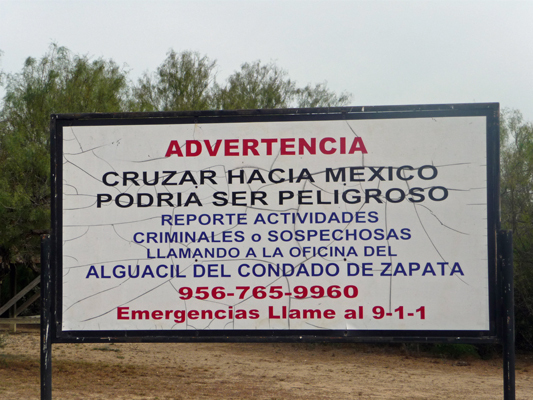 I made my grocery list and we headed south to the town of McAllen along with what seemed to be half of west Texas. We were nearing Christmas I know, but my goodness, there were tons of cars everywhere we went. Texas is full of things that are different than the west coast. The traffic lights are arranged horizontally instead of vertically. There are signs that say “Bridges Ice in Cold Weather”. Gas is only $1.67 a gallon. But this one really made our day: not just a drive-thru ATM or one drive up window. No, not in Texas. In Texas they have Motor Banks. We navigated our way to Home Depot (for trip #2 in the little repair project we had going), Sprouts (this was the smallest Sprouts I’d ever been in and had very wilted produce but we did get a few things we needed and a very nice fillet mignon for Christmas dinner) and then on to Walmart for grocery shopping again. I may not enjoy shopping here but they do have what we were looking for. When we came out of the store, Mother Nature had put on a super duper show right there in the parking lot sky. It was warm and humid that night—our Fantastic Fans close automatically when it rains or in this case when the humidity gets to about 90%. We hadn’t had them close when it wasn’t raining before so here was something else new about Texas. They’d started selling fireworks for the holidays and the folks across the road shot off a bunch of stuff late in the evening but at least by then the rooster had stopped crowing (except that he decided he needed to crow at about 3 am for some reason). I put my ear plugs in and we both did okay sleeping that night. But neither of us has much desire to return to Mission or McAllen any time soon. This is too bad because there is a really nice State Park (Day Use only) in Mission that is known for it’s bird watching. 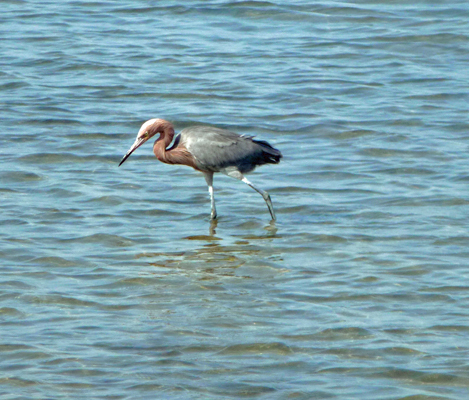 Ah well—there are many more places to see birds along the Gulf Coast. 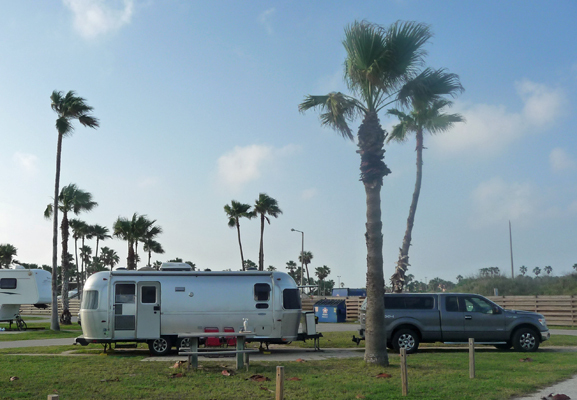 We packed up the trailer on Wednesday December 23rd, and motored southeast again down around Brownsville and out onto South Padre Island near the southernmost tip of Texas. We headed for Isla Blanca County Park which has a HUGE (over 300 sites) campground which was only about 1/3 full. Yes! We got a nice end spot that was situated so that we couldn’t have any neighbors on either side and set up camp. 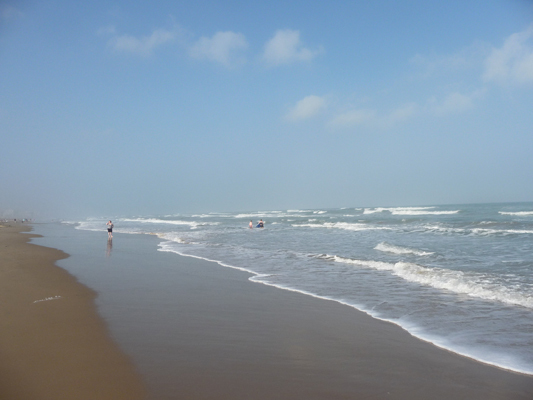 It had been close to 90 on the drive down but was only 84 at 1 pm at South Padre. There was a breeze and we opened up the windows and actually felt pretty cool. This spot even came with cable TV that had ESPN (probably only the 3rd or 4th time in over a year and a half of full timing when that was the case—clearly it was worth the $35 a night this place charges). So Walter got to watch college football bowl games. And on top of that, our phones and our hot spot worked too. 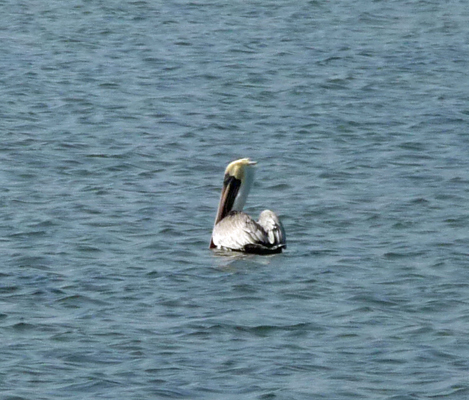 Later in the afternoon, we drove the road along the edge of the campground and stopped at the boat ramp area and there were brown pelicans! 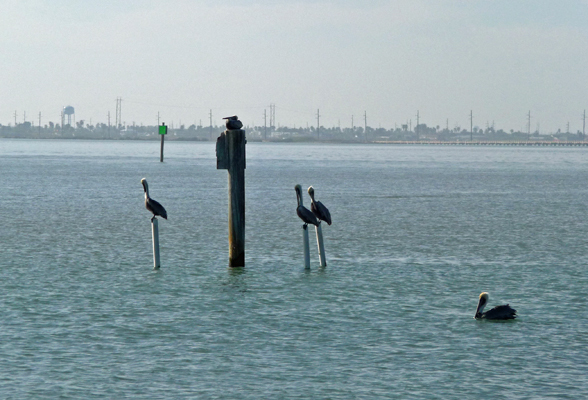 There had been pelicans on the pilings on the shore side of the bridge when we drove over so I wasn’t surprised to see more of them here. 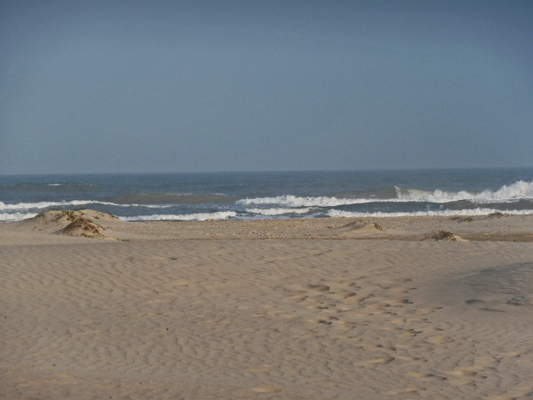 We drove on down on the ocean side of the park and stopped at the main beach area. 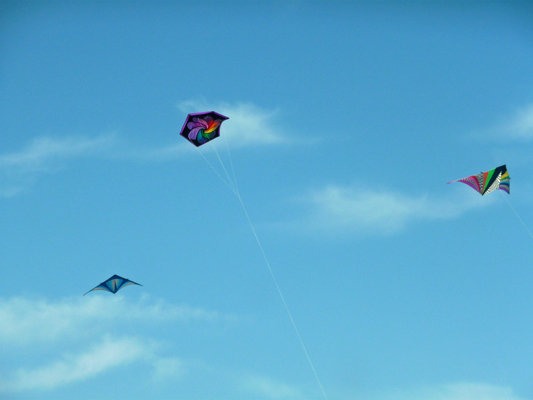 There were people flying kites in the stiff breeze. I especially like the way this one came out. 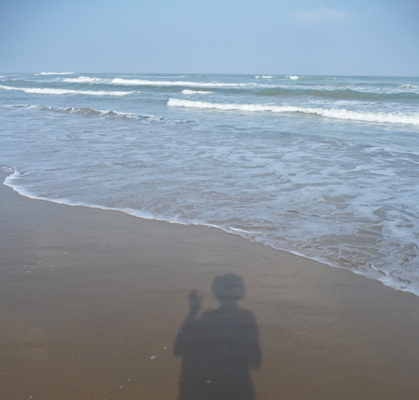 I took my shoes off and hiked across the sand to stick my toe in the Gulf of Mexico. The water wasn’t warm but it wasn’t cold either. Right down next to the water, it was really pleasant and many folks were sitting in their beach chairs with the water nibbling at their toes. 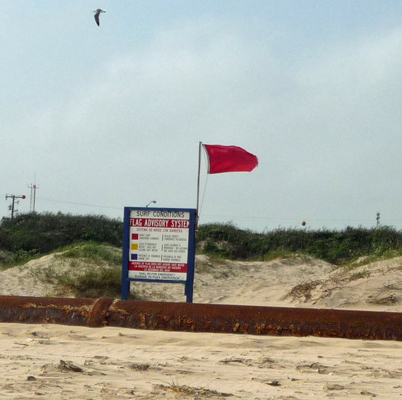 The red flags were out warning of heavy surf and dangerous currents but that didn’t keep the surfers out of the water. They weren’t very impressive and they weren’t getting great rides but they were still fun to watch. And of course the kids were in the shallows having fun. 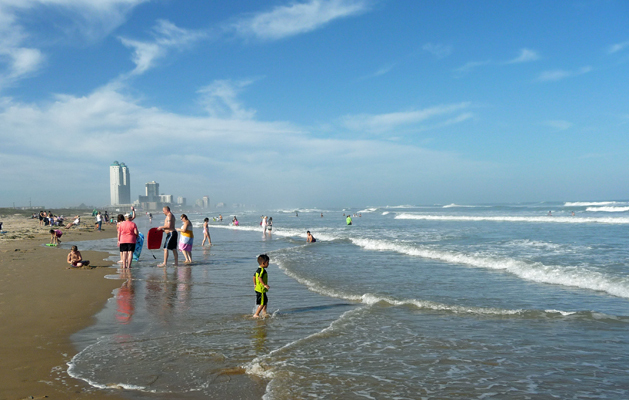 South Padre has tons of high rise hotels and condos on both the bay and the gulf sides of the island—that’s what you see off in the distance. 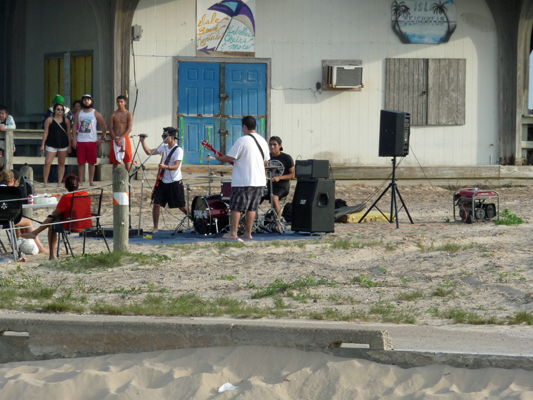 It’s THE place to go for Spring Break on the Texas Gulf Coast. So we were happy to be here in December rather than in March when the hordes arrive. By 6:00 pm it had cooled down to 73 but with 90% humidity, so the Fantastic Fans closed themselves up again. We kept the windows open and were comfortable if a bit clammy. It smelled like the ocean and it was cool and clammy so it must be the BEACH. I noticed some color developing in the sky and went out to catch the sunset and noticed the almost full moon hanging there in the sky. 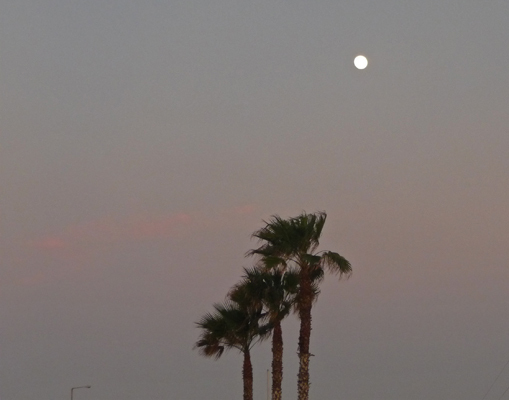 Palm trees, a bit of pink and an almost full moon--what’s not to like? And the sunset was pretty good too. On Christmas Eve, we awoke to fog followed by clouds. It kept it cooler (77 degrees) for much of the day but it was a bit dreary. Walter worked on our repair project only to find that he needed a different sized drill bit than we had to finish the job. So we drove over to Port Isabel (4 miles) to the hardware store to get what he needed to finish the project—producing what I consider a normal home repair project: 3 trips to the hardware store to get the job done. And funny thing, there was nobody much shopping at the hardware store on Christmas Eve. After lunch, Walter found a college football bowl game (The Bahamas Bowl) to watch and I took a walk on the beach since the sun had finally come out at about 2:30. It was breezy and very pleasant down by the water. I hiked down towards the high rise hotels just for a different view of things. One of the weird things about this beach is that there is this rusty old pipeline running between the buildings and the sand. 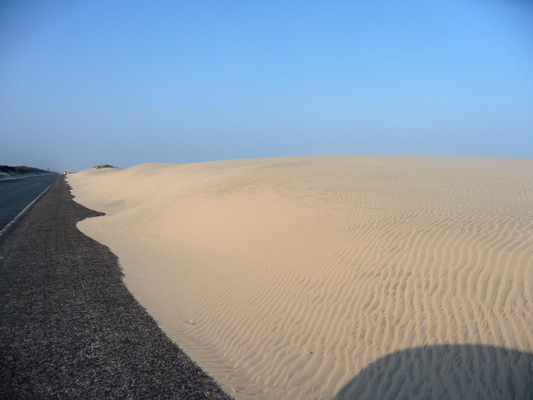 There is boardwalk access from some of the buildings and then a hummock of sand to help people cross the pipeline. 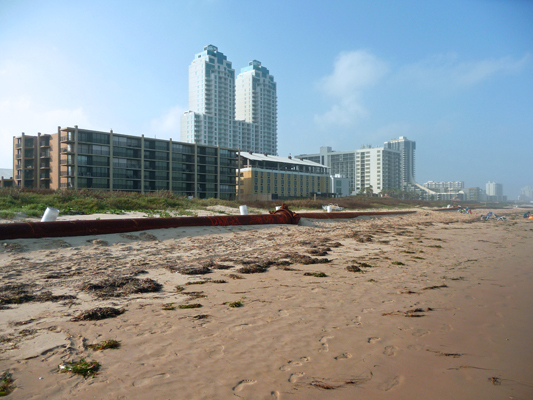 I looked it up on the internet and it turns out that the pipeline is used to pump sand dredged from the mouth of the Brownsville Ship Canal over to South Padre Island so that they can renew the sand the erodes away each year. So the tradeoff is they have an ugly pipe but they have sand and without the pipe they would soon have no sand at all. The angle of the sun made for good shadows and I thought I’d take a selfie of shadow-Sara just to say hi. 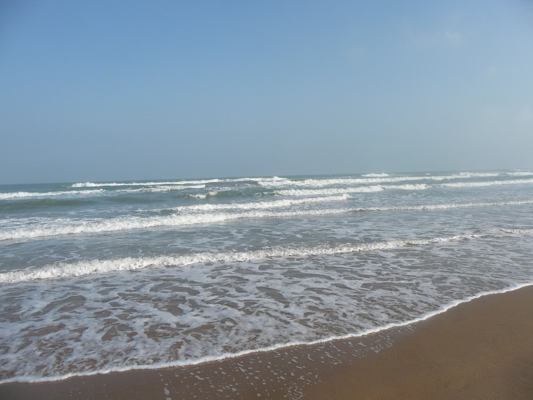 There were a few people out playing in the water—it was really nice to have it lap my feet as I walked along. And someone was flying a drone up the beach. It’s amazing to me the effects of the moisture in the air on visibility and my photos. Looking into the sun the photos actually come out better—the opposite of what I usually experience. 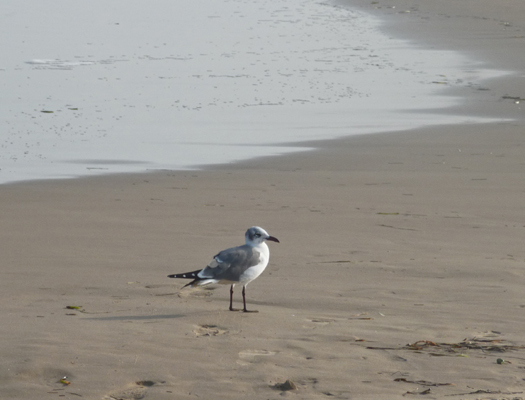 Even the sea gulls are different here in Texas. This is a Franklin’s Gull—very pretty coloring. They also have gulls that are called Laughing Gulls that have a bit more black behind their eyes. When I got back from my walk I took a photo of Genevieve and François in our campsite—note the palm trees blowing in the wind. Late in the afternoon we decided to take a drive out towards the end of the road that runs out along the island. We got to drive through ‘town’ where there are tons of hotels most of which looked pretty empty but which no doubt fill up with people come Spring Break, I guess. In any case, Christmas Eve was clearly not high season. 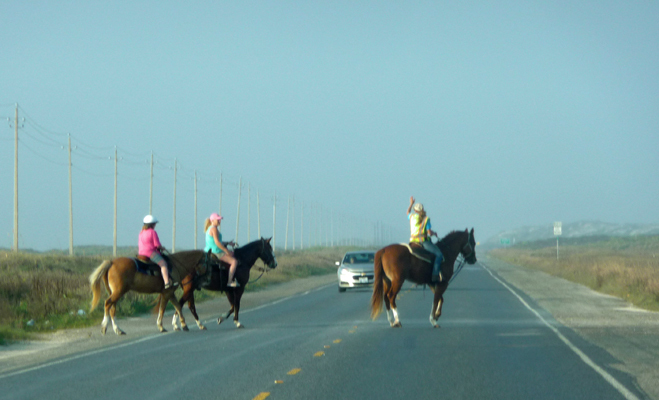 Just past the last of the condos we came upon horseback riders crossing the road—headed for a ride on the beach perhaps? 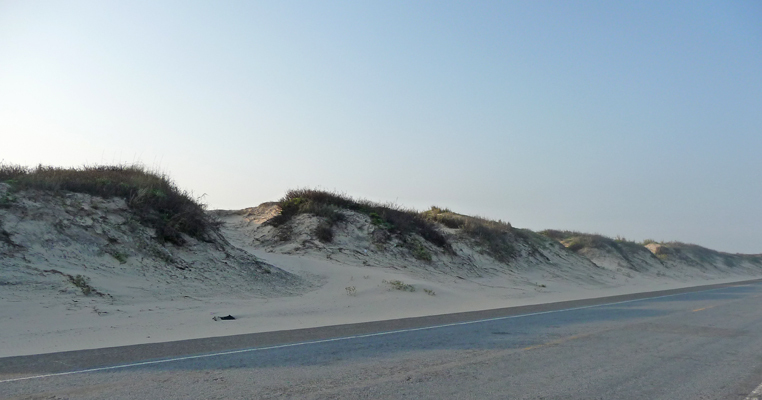 As you drive farther out along the road, sand dunes appear and begin to creep onto the edge of the road on the ocean side of the island. On the bay side, there are grasses that seem to hold the sand in place. 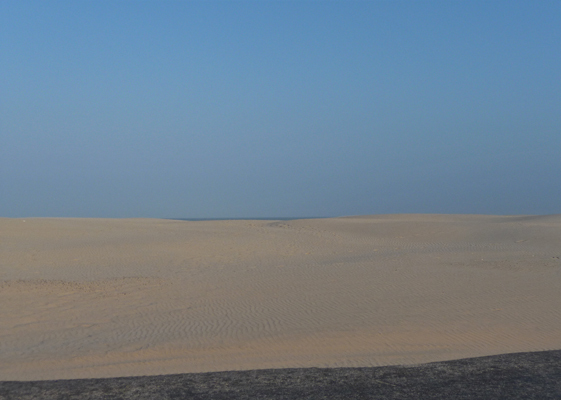 We drove all the way to the end of the road and when we got out to change drivers I realized you could see the ocean just past the top of the dunes—see that little sliver of blue? I couldn’t resist climbing to the top (they’re not that high) and sure enough, there was the ocean (and people playing and driving on the beach). You can drive your RV out onto the beach and camp here ($5 to get onto the beach) but the sand is pretty soft and we didn’t want to chance getting stuck out here. We saw one rig as we drove by the most popular area for boondocking but that was all. The clouds rolled in at about 4 pm so we didn’t get to see the moonrise or the sunset on Christmas Eve. But bright and early on Christmas morning the sun was out! 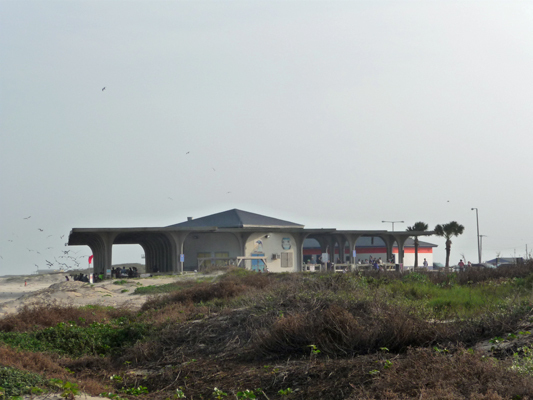 We had breakfast and then drove on back out the main road again to the South Padre Island Bird and Nature Center (which of course was closed for the holiday). 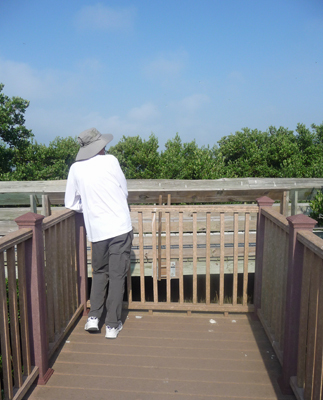 But their boardwalk was open and it was a great day for bird watching. We didn’t realize it until later but we hiked their walkway backwards—I really don’t think the birds could tell the difference do you? 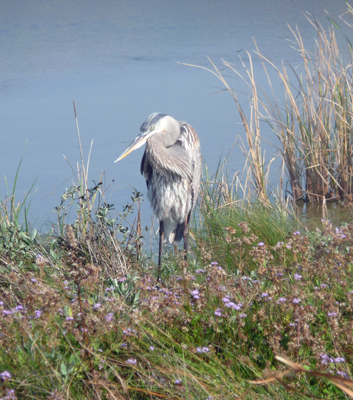 First off we spied a lovely Great Blue Heron in amongst the grasses. 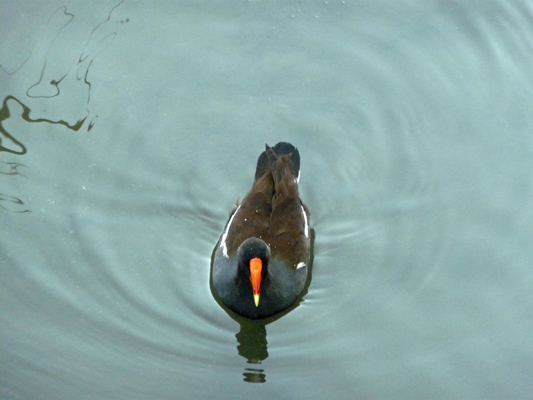 And then as we moved along we saw a number of these little birds that looked like mud hens (coots) with bright orange on their beaks. 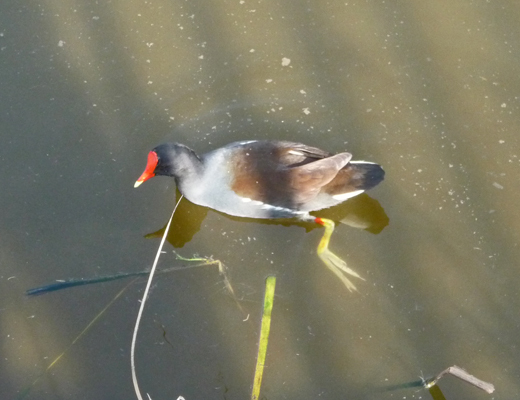 In fact they are moorhens, a close relative of mud hens. Not only do they have a break red patch on the beaks but they have bright yellow/green feet too. We followed the pathway out toward a viewing area where we saw people, only to discover that they were on a different pathway and while the two boardwalks come very close, you can’t move from one to the other. We found two places like this. I think that normally you have to pay to walk on the Bird Center boardwalk while the other boardwalk starts further down the road (at the convention center) and may be free, so they don’t want the folks from the free boardwalk to cross over onto the paid one. We moved from the freshwater area out into the edges of Laguna Madre which is one of only 5 hypersaline lagoons in the world. The water here is 1.5 to 3 times as salty as the ocean. And the birds seem to love it. 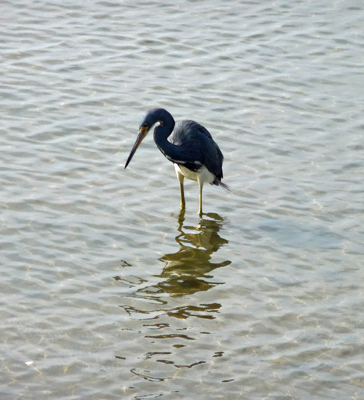 First off we saw a Tri-colored Heron hunting in the shallows. 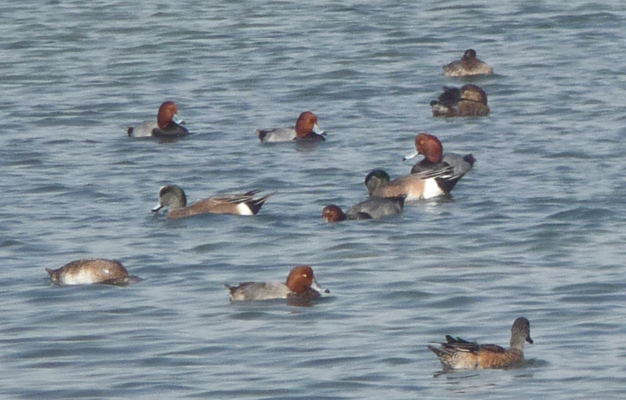 And out a ways off shore there was a large raft of ducks, including a lot of Redhead Ducks with blue bills. 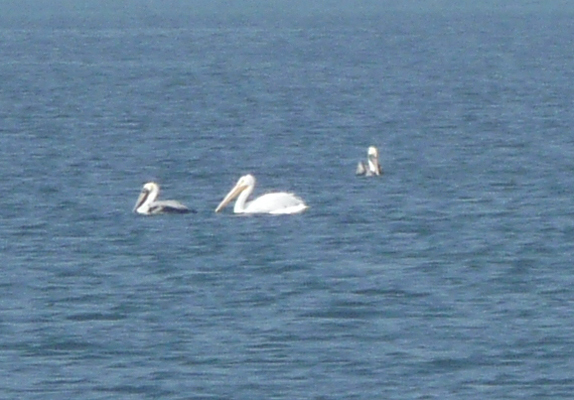 There were a few white pelicans (we saw tons of these at Salton Sea last winter. They usually stay inland but someone said they were here as part of their migration). 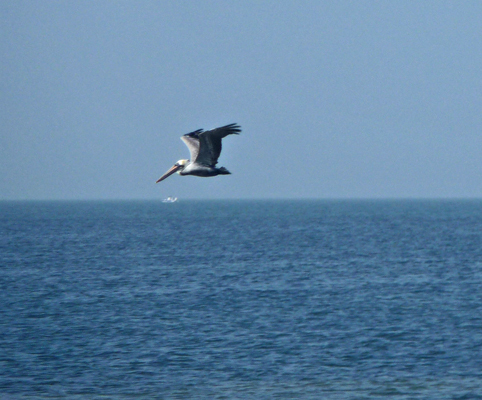 In fact, there was a HUGE flock of them further up along the shore. There was a school of fish coming through the shallows and the brown pelicans put on a real show, diving in with great belly flop splashes—I didn’t get any splashes but I did catch this guy mid-dive. 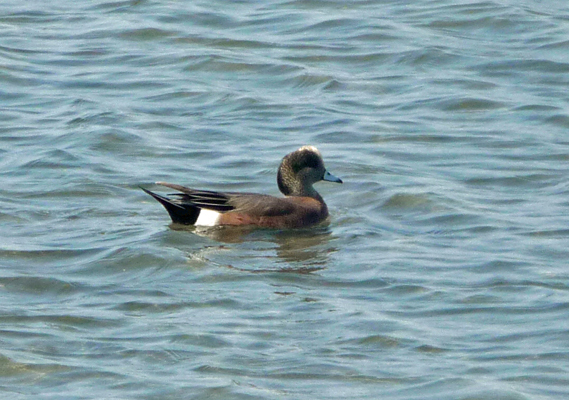 I took a lot of photos of this interesting duck so I was glad to find out later that it was an American Widgeon. 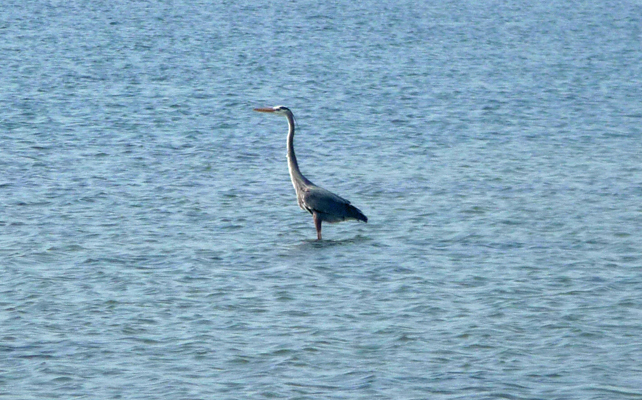 While we sat in the nice shady covered bird blind, another Great Blue Heron flew in and posed for us. 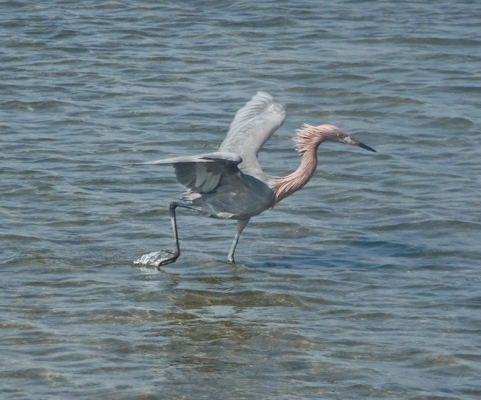 And this marvelous Reddish Egret (who was much smaller than the heron) came out to hunt. At one point he danced around and put on a great show. 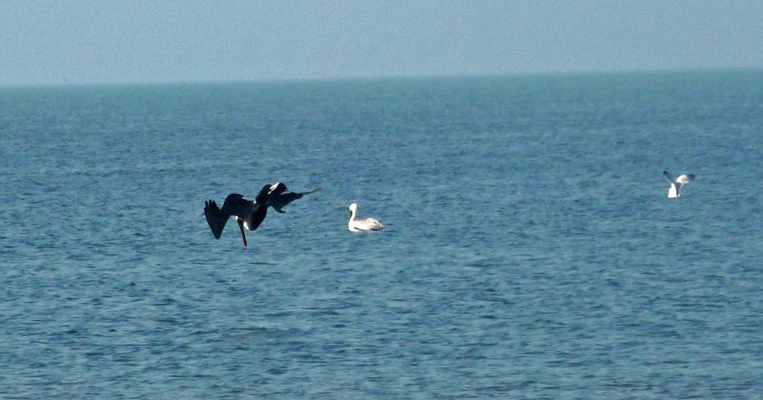 Meanwhile the brown pelicans continued to hunt from the air. Then what looked like a new kind of duck joined the raft of ducks. 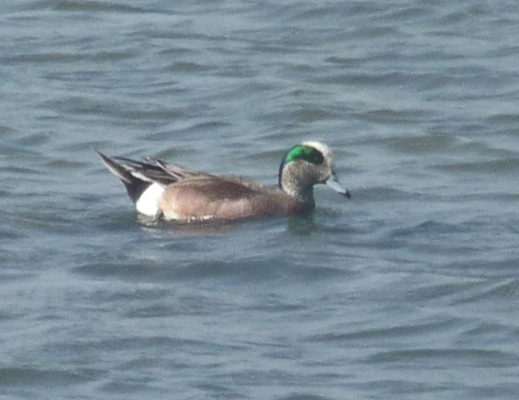 He had a large green streak over his eyes and a nice pointed tail and turned out to be a different form of the American Widgeon. 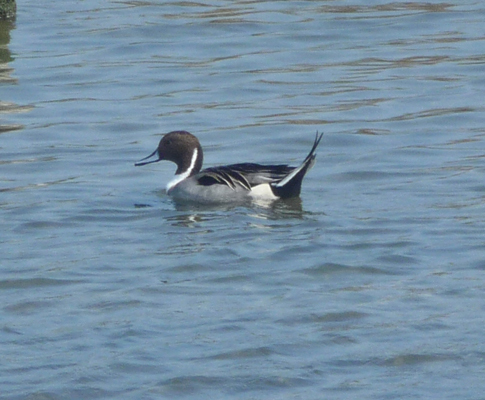 And then I managed to get a decent shot of a Northern Pintail. Don’t you just love that nice pointy duck-tail? 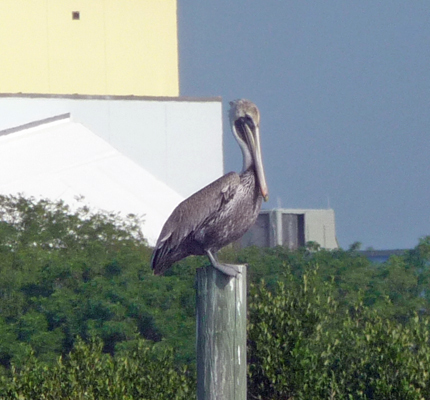 We wandered back along the trail and spied a brown pelican doing one of the things they do best—sitting on a pole. 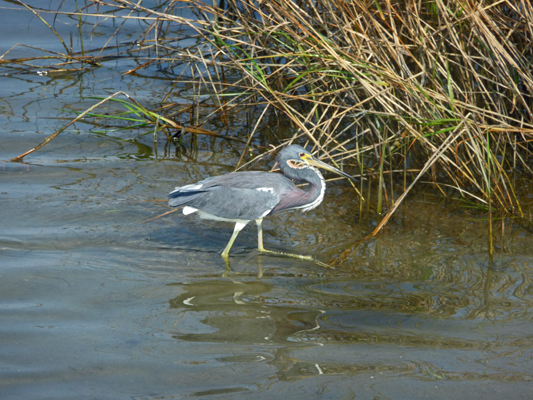 As we moved back into the fresh water area (the wastewater treatment plant disgorges water into the freshwater lagoon here to keep it charged up) I spied another tri-colored heron. And then we saw several large schools what looked like catfish! 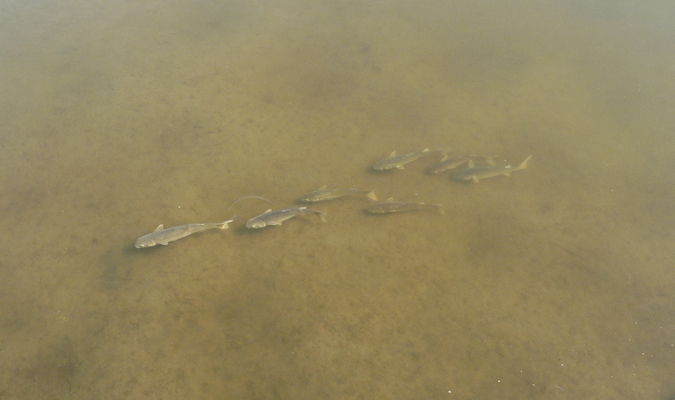 They were clearly bottom feeders and weren’t bothering the schools of smaller fish that we could see in the lagoon. 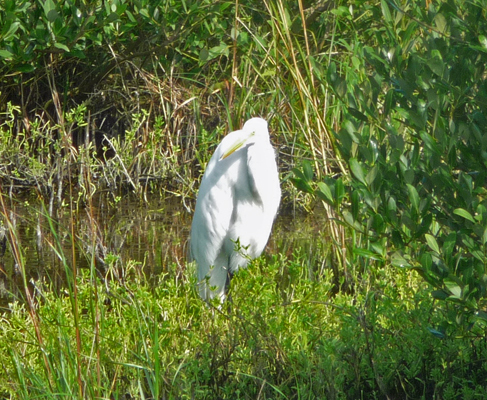 Walter spied an egret (we’re not sure which kind—they have 3 different species of egret here). 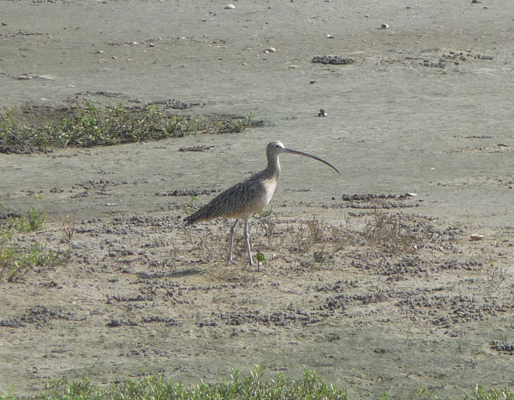 And over on the far shore of the lagoon I noticed a Long-billed Curlew—don’t you just love that long curved bill? 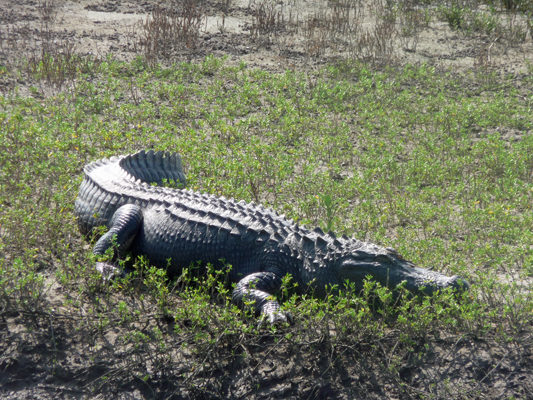 I was so focused on taking photos of him I didn’t notice the alligator sitting on the shore just behind him. He didn’t move the whole time we watched him, but then they often-times don’t. 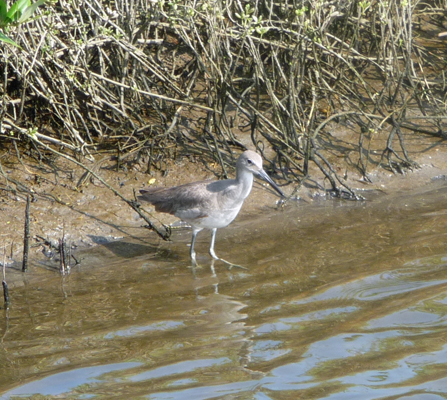 Our last bird sighting was a sweet little sandpiper at the water’s edge. 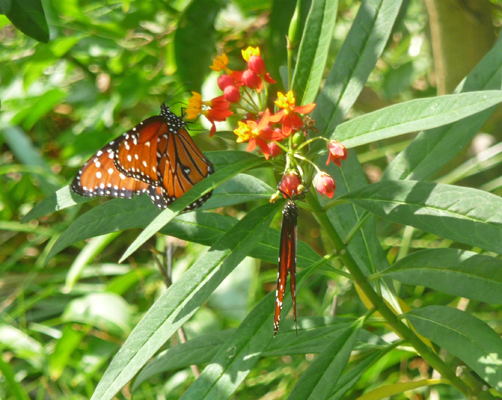 We arrived at last at the bird center and walked through their butterfly garden and didn’t see many butterflies. But on the way back to the truck I spied a pair in amongst the flowers. 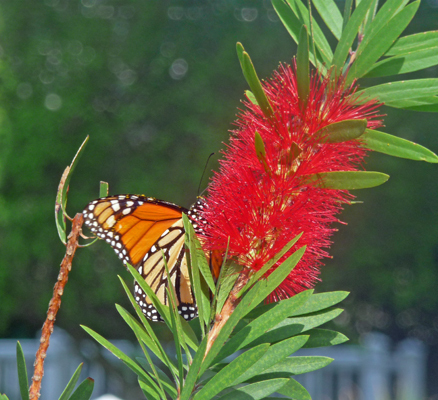 And another feeding on a bottlebrush bush. 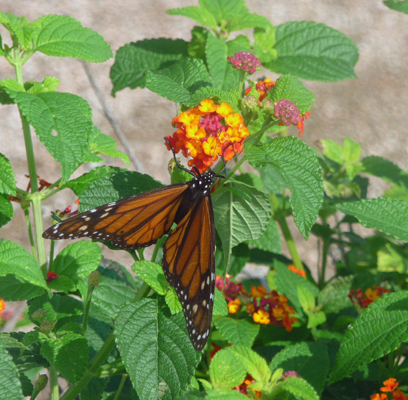 There were sulfur butterflies flitting about too but none of them stayed still for me to photograph them. 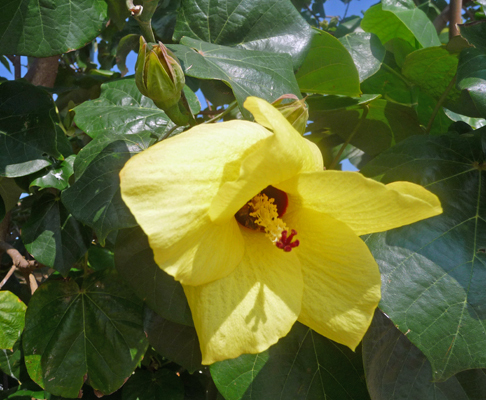 There were lots of hibiscus in bloom here including this stunning yellow one with flowers about 4 inches across. All and all, it was a great way to spend Christmas morning here at the beach. The wind stepped it up on Christmas night and the temperature stayed above 75 all night so we had a noisy warm night of it. There were high wind advisories starting at 9 am but the wind stayed in the 7 to 18 mph range for much of the day—much better than the predicted 45 mph gusts that were possible (and recorded somewhere on the island I saw online). The UW Huskies were playing Southern Mississippi in the Heart of Texas Bowl in Dallas on Saturday afternoon so Walter was pretty much glued to the TV for the day since there were a number of other bowl games to watch too—the man does love his college football. The temperature was climbing into the 80’s in the trailer (you don’t put the awning out to shield it from the sun when the wind is blowing hard) so I took off to go for a windy beach walk. The sand was scuttling along over the parking lot and on the beach (but not up into your eyes—you just got your ankles sand blasted). No one was out sitting on the beach but there were lots of folks out walking and playing in the waves. 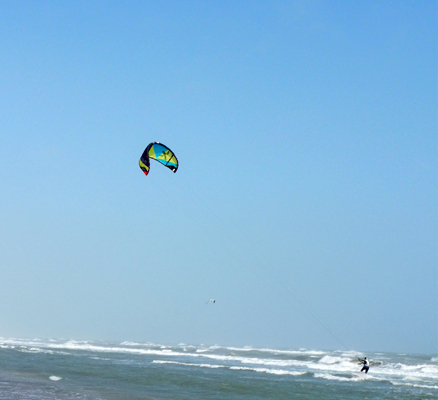 But even better, there were folks out kite surfing! While I was out watching there were maybe 10 kites out. 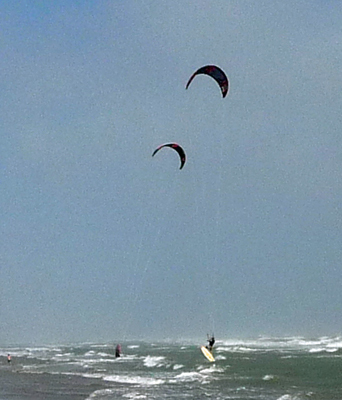 I suspect the wind was well over 20 mph on the beach and way more than that out on the water. And boy were the surfers roaring along! 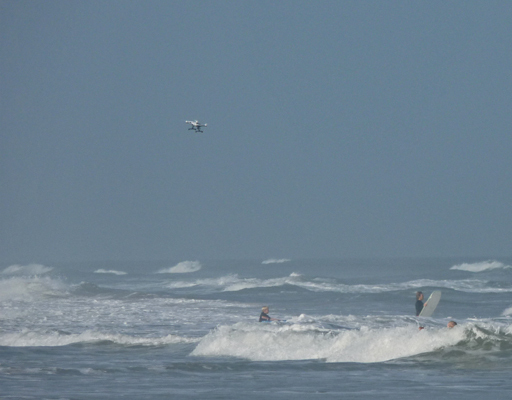 Needless to say the red flag was out for high surf but the wind surfers clearly didn’t care. At one point one of the surfers came fairly close into shore (while there was another one going out) and you can see he got quite the hop on his board. These people clearly knew what they were doing. I didn’t see one of them crash and burn the whole time I was watching. Just before I gave up, I managed to capture 3 kites at once—all close to shore—one surfing, one coming in and one going out. 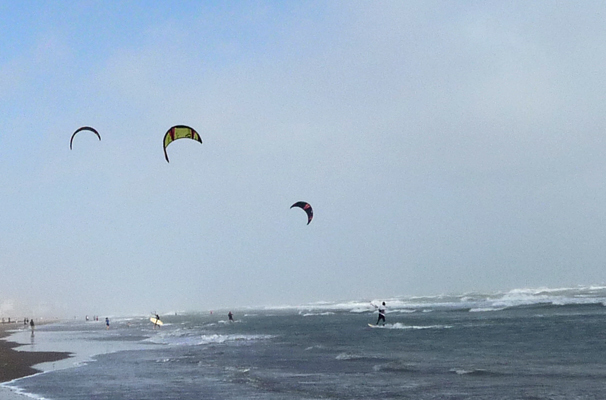 When they come in, they have to keep the kite under control while carrying their boards in. 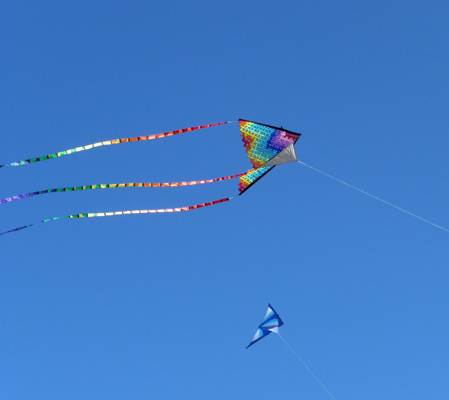 And then they lower the kite so someone on shore can catch it and fold it up a bit. Once on the beach, they put their boards on top of the kite to keep it from taking off again, while they roll up their lines to pack up. 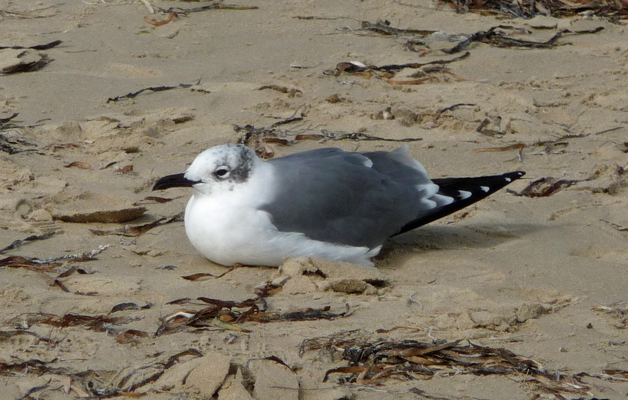 Most of the gulls weren’t flying in the wind but a few of them were hunkered down on the beach. Mid-afternoon while Walter was watching the Huskies beat Southern Mississippi 44 to 31, we began to hear what seemed to be live music wafting across the campground. I went out to investigate and discovered that it was serious work to walk straight into the wind when it was blowing 15 mph! I walked through the campground following the sound and came out at a boardwalk that led down to the beach. At first I thought that the music was coming from the pavilion on the beach since there were so many people gathered there. But on careful examination I decided I was wrong, so I walked further up the road towards the pavilion and discovered the band set up outside the pavilion, playing to a small group of people at some picnic tables—with the rest of the crowd milling around behind them. Their amps put out a LOT of sound and they were playing mostly hard rock. Of course they HAD to be loud since they had to drowned out the generator that they had running for their equipment. It amazed me that three guys could make enough racket that we could hear them blocks away. On the way back, I stopped and asked some folks if this was a regular Saturday afternoon thing. And they said it was the first time there’d ever been music here when they were there and they spend the entire winter here. The wind continued to blow and the clouds came in late in the afternoon (as usual) but cleared off just enough at sunset to give us a bit of color. Notice the palm fronds all pointing north—it was windy. I awoke at about 5:15 with the moon shining in my face through the skylight. The sky had cleared for a few minutes at least but the wind was still howling. It was 80 degrees in the bedroom (with all the windows closed) and when I went into the dining area you could see that the palm trees were bending in the wind. The outside temp was 77. The forecast for Sunday was for more wind with a cold front coming through (the one that had produced 4 seasons in Texas the day before, with a blizzard in the panhandle area, tornadoes in Dallas, floods in east Texas and temps in the 80’s with high winds down where we were). The wind was supposed to continue to blow for another 24 hours but change direction about 1/2 way through the day. 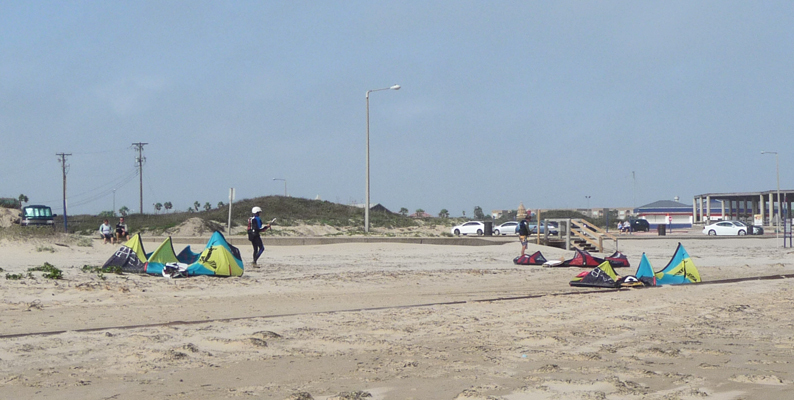 We decided to brave the bridge from South Padre to Brownsville in the wind and head inland for a couple of days. The bedroom was 82 when we got up at 8:30 in the morning and the wind was still howling. We broke camp (an interesting process when the wind is blowing hard) and Walter drove a cautious 30 mph across the bridge with no problems—whew. We found a nice spot at the Honeydale Mobile Home and RV Park in Brownsville for just $18 a night for a full hookup (with good free WiFi) with our Passport America Pass. 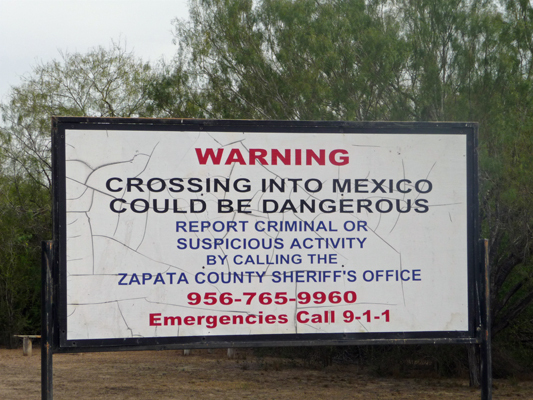 When we arrived it was 79 degrees and the wind was out of the southwest. By the time we finished registering, the wind had shifted to come from the north and by the time we got ourselves parked I was beginning to feel a little cool in my tank top! Sure enough it was already down to 72. The temperature continued to drop all afternoon until we hit about 55 and had to turn on the heat—what a concept. In addition, the humidity plummeted too. It had started at 90% and by the time it got down to 55 it was 55% and the dew point (which had been 73 degrees for days) was now 34 degrees. Amazing. There were thunderstorm warnings further up the coast but we didn’t see a drop of rain.